Download Easy Tap Urinary Leg Bag Flyer.pdf. 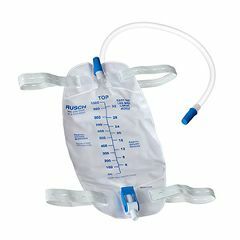 AllegroMedical.com presents The Rusch EasyTap™ Leg Bags which is made of high grade vinyl material (PVC) and contains an anti-reflux valve. It is available in 500 mL and 1000 mL. The leg bag is secured with two cloth straps with buttons. It also contains a flip valve for easy emptying. Not made with natural rubber latex. Bags come with or without 18" extension tubing. I am a 75 year old male. I have been on a catheter for some time now because of prostate cancer and I find this product to be extremely useful. It works great for going out in public instead of having to wear the large bag. The smell leaks thru after few days and I need to change the bag. Don't want people to think I stink from the smell. It is a good bag only the smell coming thru. by Big Jim from Littleton CO. Very sturdy bag. Holds together for a month with no problems. Just be careful if someone else removes pants, it will grab the flip valve and open creating a wet mess. If flip valve is open slightly it will leak, make sure it's closed tightly. Great price, for what I use it for. Due to the fact that I am still waiting on my flip flo catheter valve order, which are still unavailable, I ordered this bag that has a flip flo valve attached. I remove the valve and attach it to my foley catheter. ( I don't use leg bags). It doesn't work as well as the valves I ordered, but it does work and I save money. Without these valves I would be back to wearing a leg bag again. Does Rusch no longer make the flannel-back leg bag with button straps? Do other bags have button straps? I cannot work the straps with all the holes. I was advised by Teleflex (Rusch) that the manufacturer of the buttons no longer makes them; also Rusch does not have a bag with the flocked back. My brother has MS and we have used these bags for years. The toll-free # for Teleflex is 1-866-246-6990; I was transferred to a lady who works for Teleflex located in Lithonia, GA. She said a competitor, Hollister, makes a button bag, I think with flocked backing but I have not been able to locate any answer or speak to anyone with Hollister regarding their bag. We have not been able to find another comparable bag - none with flocked backing and none anywhere near the quality of the former Rusch Button Bag. It was absolutely the best and, believe me, we have tried them all. Sure wish someone made the same quality bag! !